I have been meaning to post about this topic for awhile, but due to work and life I haven’t had the time or energy to write posts for this blog. Anyways, let’s get to it. About two or three years ago I was just getting started with python. I had a few little python projects I was working on and was starting to explore the data analysis tools in the python ecosystem. I stumbled across the Anaconda python distribution which offers a python distribution and packaging system that comes with all of the non-python dependencies required by many of the data analysis focused packages (matplotlib, numpy, etc…). Having recently experienced some of the struggles of getting up and running with these packages, I decided to give Anaconda a try. After all, what is the worst that can happen…. The installation was fairly painless, just download the installer, run the bash script and respond to the questions when prompted. Accepting the ‘Terms and Conditions’ was a little annoying, but overall it was a pretty painless install and before I knew it I was up and running with ipyhton notebook, matplotlib, and pandas. It was nice that everything just worked out of the box, and the environment and package management systems seemed to be pretty cool. After playing around with Anaconda for a bit, I decided to switch back to working on one of my python projects and to my dismay, nothing was working! After a very long and frustrating afternoon, I eventually figured out that I had accidentally allowed the Anaconda installer to prepend the path of the anaconda distribution into my .bashrc file. So when I tried to run my python existing python projects (all of which were in virtualenvs) I got errors related to the python version that was being used (can’t re-call the exact errors, it’s been awhile). After some more time of trying to figure out a way to get virtualenvs to work within conda (Anaconda’s environment isolation tool), I decided to just uninstall Anaconda and restore my original .bashrc. It’s worth mentioning that not only was a fairly new to python, but I was also fairly new to Linux at the time as well. Had I been a little more experienced, I would have known that I could just restore the original .bashrc file without uninstalling Anaconda, and things would have returned to normal for my existing python projects. I eventually settled on a sub-optimal solution where i installed Anaconda into a separate chroot (essentially a sandboxed OS). As such, I never really used it that much due to the difficulty switching between the two environments. So now when I want to use Anaconda, I just type <code>enterconda</code> in a terminal, and from there I can launch an ipython notebook sessions or drop into a python shell and have access to all of the popular python data tools. You had to scroll through the entire text of the Terms document (either using the enter key or the down key, can’t remember which), and when you got to the bottom if you didn’t release the key at the ‘Do you accept’ prompt, it would abort the installation with a message like ‘You must accept the terms and conditions in order to use Anaconda.’ Essentially it was accepting the scroll key as a valid negative input to their ‘Terms and Conditions’ prompt. It took a few attempts to get past this (the T&C was real long, and who reads those things anyway!). 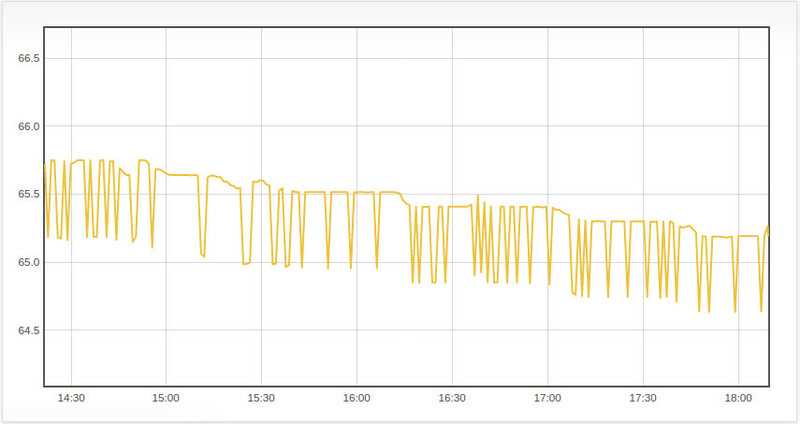 So I mentioned in a previous post that I was getting the occasional bad reading from the DS18B20 temperature sensor that I was using to monitor beer fermentation. I noticed the issue because I was getting very ‘choppy’ temperature profiles. It was obvious that really low temperature values (in this case it turned out to be a value of -0.06, not sure why) were getting averaged into the temperature readings (the system averages 60 readings at an interval of approximately 1/sec, and then sends that average across the network). While I was aware of the issue pretty soon after getting the system up and running, I was a bit pressed for time and decided to put fixing the issue on the back burner. Example of the impact of the bad reads. Every few minutes, a bad read would get averaged into one of the data points, causing the temperature to appear lower, resulting in this ‘spiky’ profile. Coincidentally, the issue ended up fixing itself (sort of). 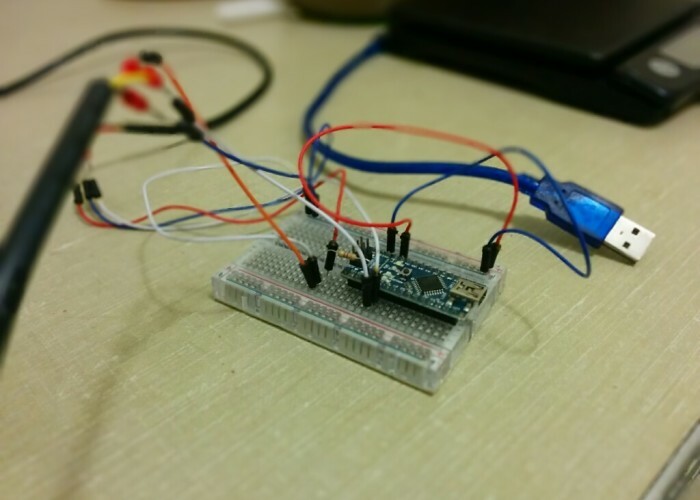 After a few successful trial runs, I added an additional temperature sensor to the Arduino, and in order to be able to identify the data coming from the two sensors, I needed to pull the serial addresses. Turns out that the bad reads that I was getting also resulted in a bad address, so I added some code to throw out that data. 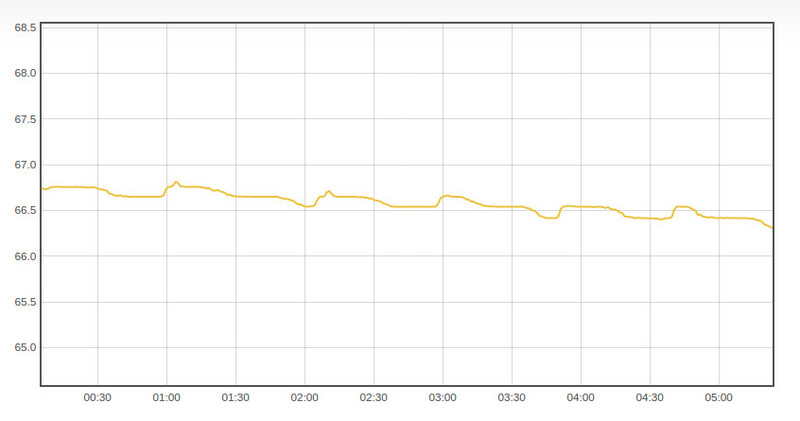 Notice how the fluctuations are on the order of magnitude of ~0.1 degree F, as opposed to ~1 degree F previously. Much better! 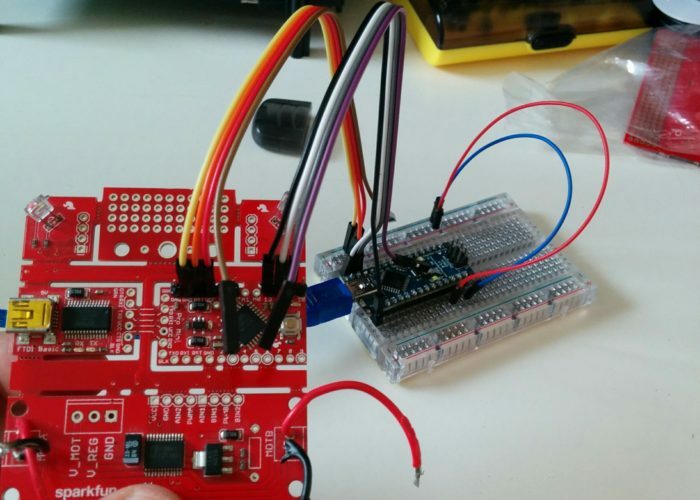 So I should probably mention that this entire issue would have been avoided if I had just copy and pasted the Arduino sketch code for the DS18B20. In the example code, they have a few different checks, such as a check that ensures the sensor is of the right type, as well as a CRC (cyclic redundancy check) validation. The CRC is very similar to a checksum,the senor performs a mathematical operation on the data and then sends along the value (the CRC) of the operation. This allows the person to verify that the data was successfully transmitted by re-performing the operation and comparing it to the CRC value. If the values do not match, it probably means that there was an issue with sending the data across the wire. The code in question is below. Had I included the above code in my sketch, this issue would have been avoided entirely. But considering I am doing this project for fun and for the experience/education, I think writing the code from scratch is a good thing to do. I have certainly created some unnecessary bugs with this approach, but I have also learned a lot more by not copying and pasting code. But this is also a good lesson in making sure to inspect example and tutorial code very thoroughly to ensure that you are not leaving out anything important. 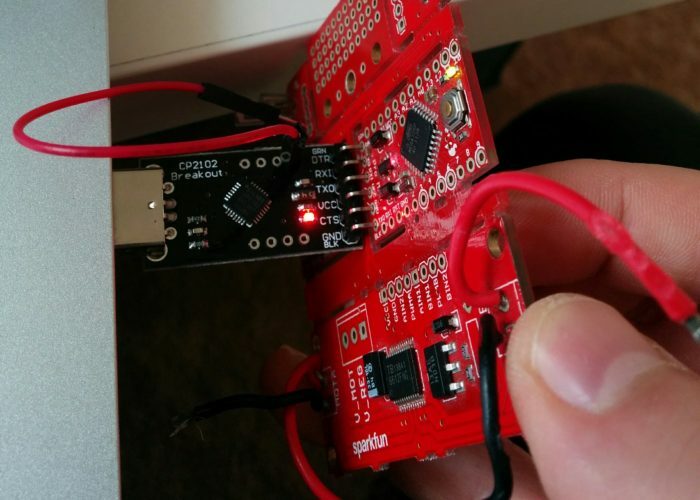 In this case, leaving out the sensor type check code (the one wire library can work with multiple digital sensor types running on the same pin) made sense because I knew I was only using a certain type of sensor. Nut leaving out the CRC validation was a bad call. Transferring the Single Hop Cascade and Single Hop Simcoe to secondary. I brewed two more Single Hop batches. This time using Armarillo and Sorachi Ace. Close up shot. 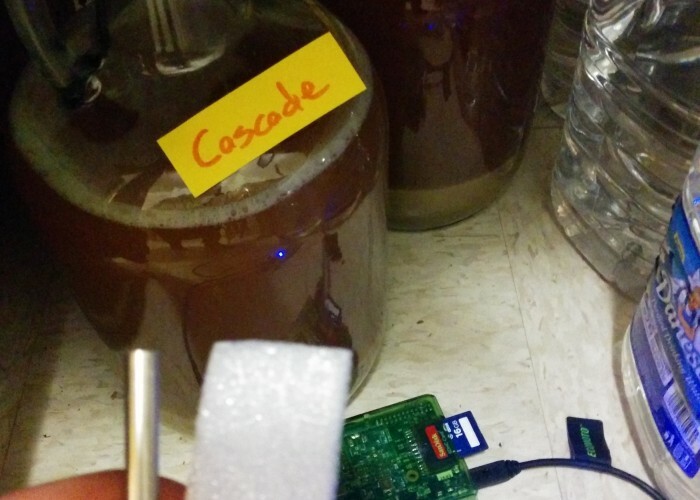 I moved the fermentation temperature sensor from the Cascade to the Amarillo. You can see the ambient temperature sensor hanging in the foreground to the right. Eventually it would be nice to add a few more sensors so I could monitor all of the beers, but for the time being, keeping things simple. 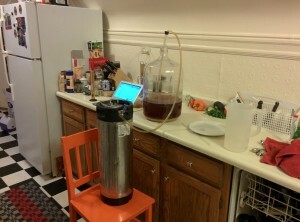 I brewed two more one-gallon batches of Single Hop Pale Ale. I used Armarillo in one, and Sorachi Ace in another. 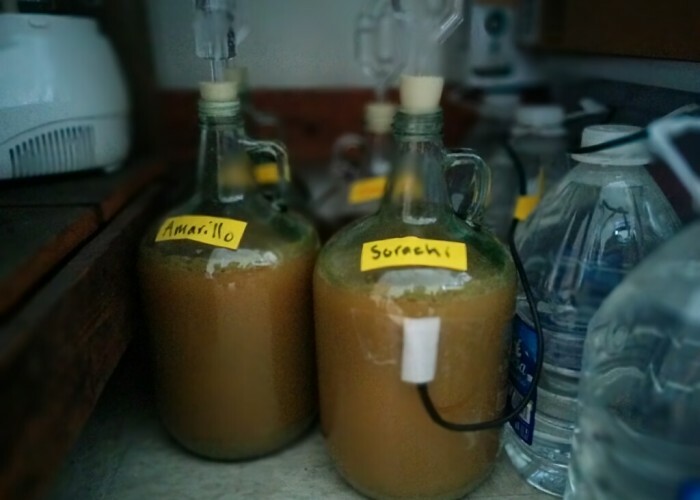 Looking forward to drinking these. I’ve got a lot more work to do on the project, and will try and fit it in here and there, so stay tuned. 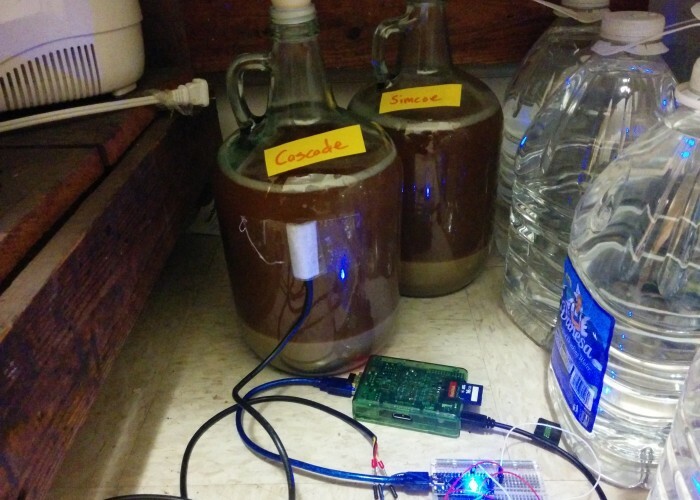 In my last post, I went over the development of a fermentation temperature monitoring sensor using an Arduino and Raspberry Pi. 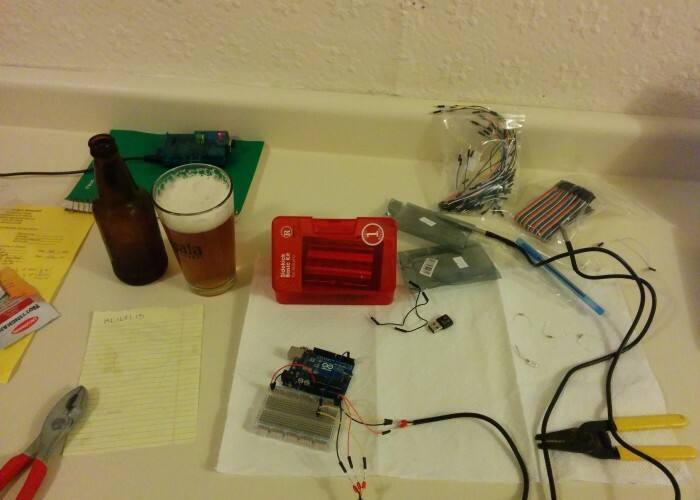 The goal of the project was build a system that would allow me to remotely monitor the temperatures of my beer fermentation. 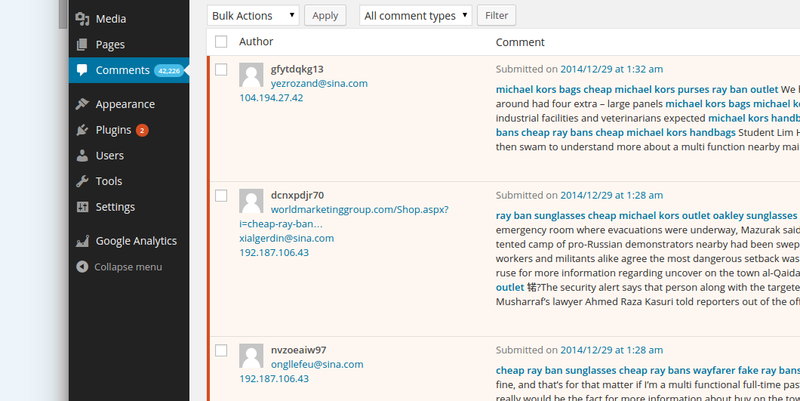 In this post I will be discussing the server and web application portion of the project. 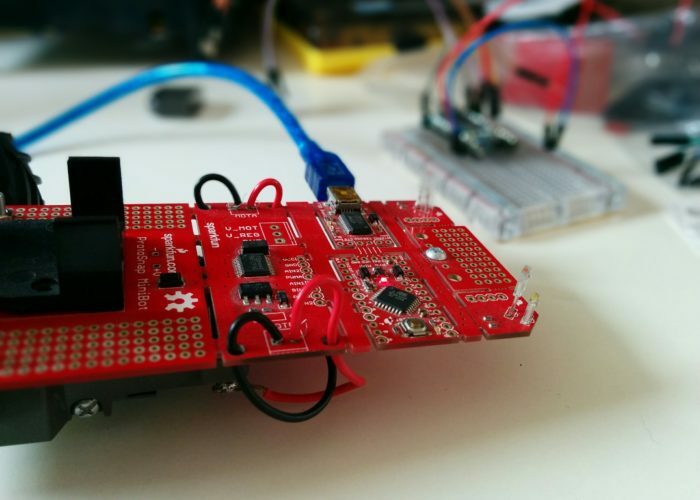 The code I wrote for the sensor portion of the project included a socket server program that could be used for testing the network connection between the sensor and a remote server. This socket server code is also included in the web application code with a few small modifications. 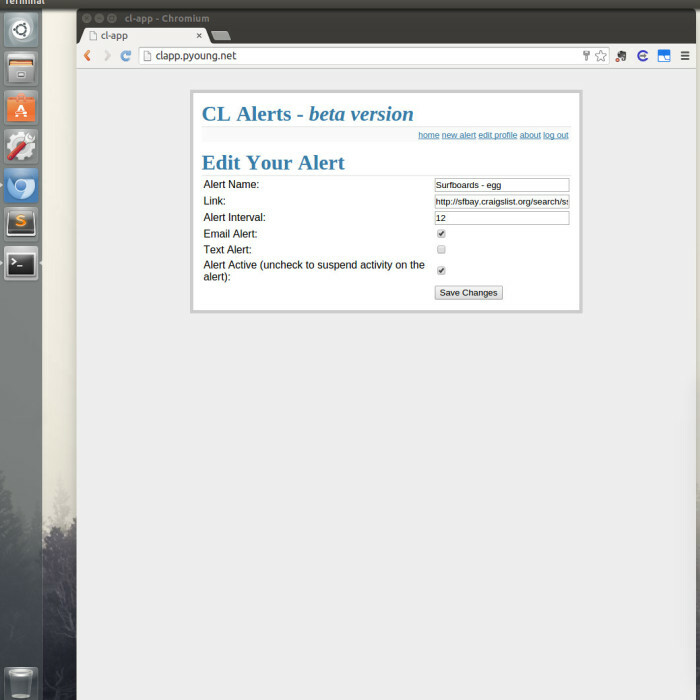 Details on how to setup and run the code can be found in the readme. 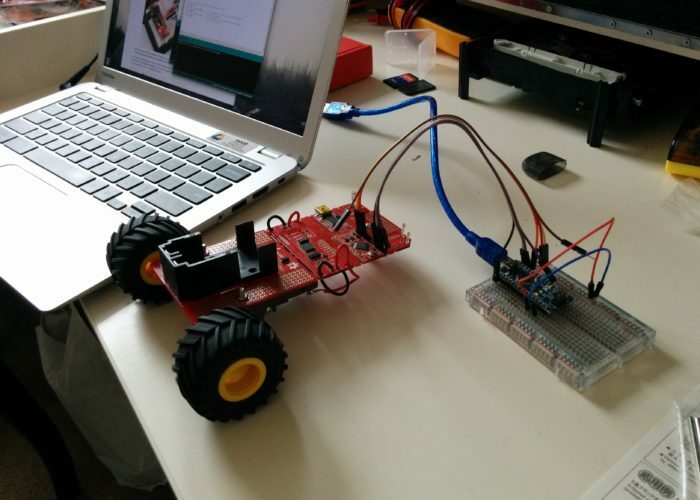 The project is very much in the prototype stage at the moment. 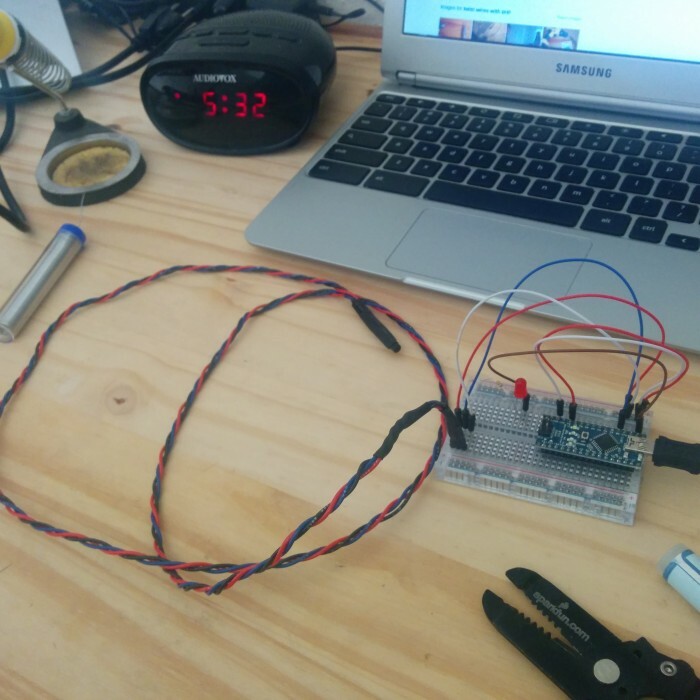 I have a few more temperature sensors on order, and as I get a better idea of how to handle the data I will start finalizing the backend and add some more features on the frontend. In addition to handling multiple temperature sensors, I would also like to be able to specify data recording parameters from the web frontend. While I wait for the sensors to arrive, I have been testing out the system, and have had some interesting results. 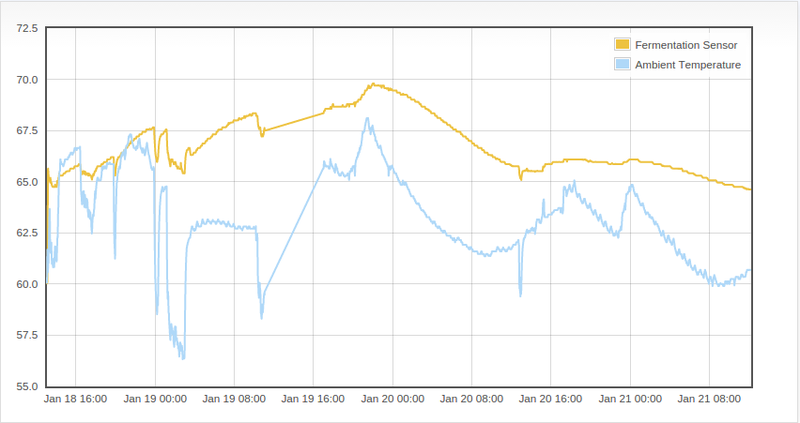 For the first test I simply set the sensor up in the kitchen and began recording and displaying the ambient temperatures. A screenshot of the flot chart is above (i still need to figure out how to export flot charts as images). Everything went smoothly with the test run. 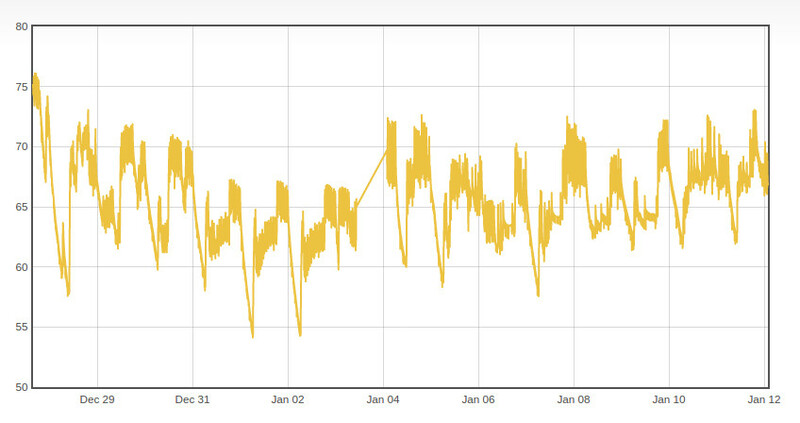 As you can probably see, there was a brief outage on Jan 3rd. This was because I had unplugged the sensor while clean the kitchen and forgot to plug it back in until later. 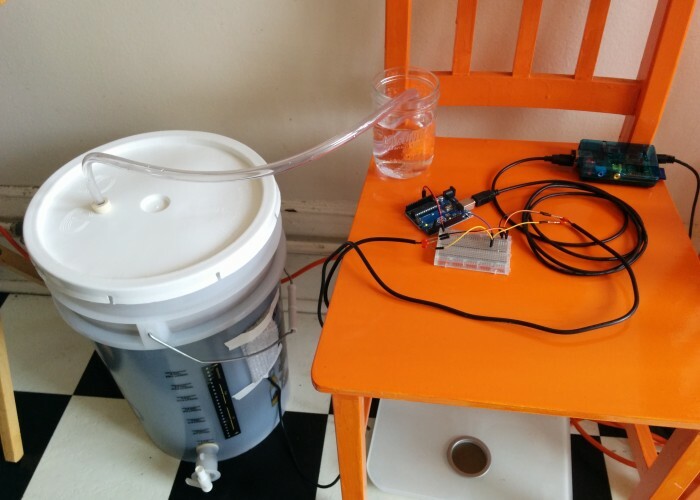 I finally got around to brewing some beer this past weekend, so was able to get the sensor hooked up to an actual fermentation. 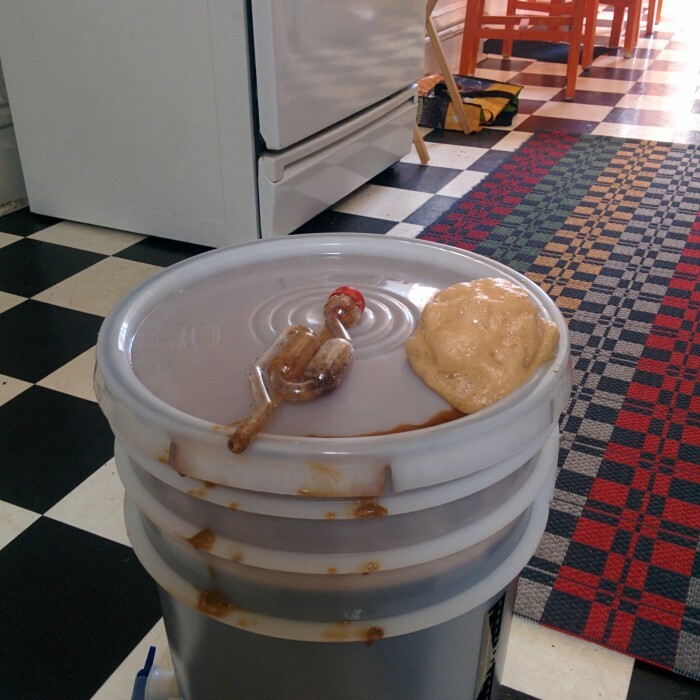 For this brew session, I made two one-gallon batches of beer. The standard hombrew batch size is 5 gallons, but I like to experiment from time to time with smaller batches. 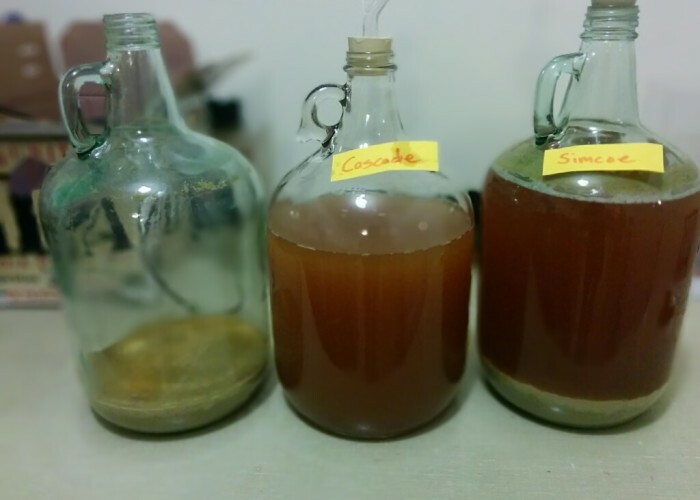 For this experiment, I was making two single hop pale ales, using the exact same grain and yeast for the two beer, but using a different variety of hop in each beer. 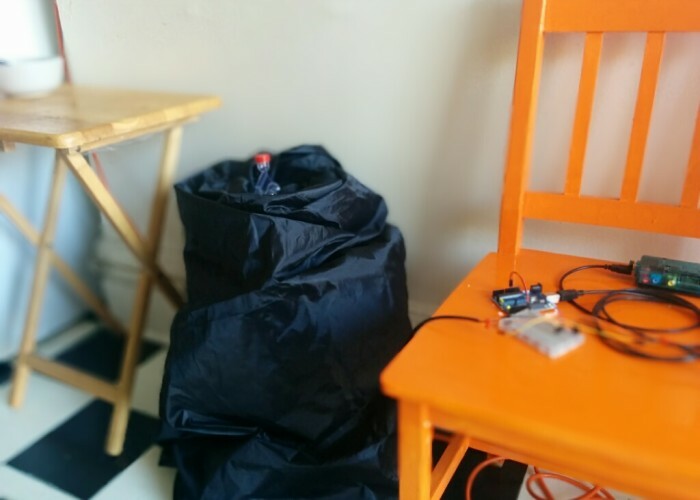 Once the beers were brewed, I taped the temperature sensor to one of the carboys and added some packaging foam to the back of the sensor to try and provide some insulation from the ambient conditions. 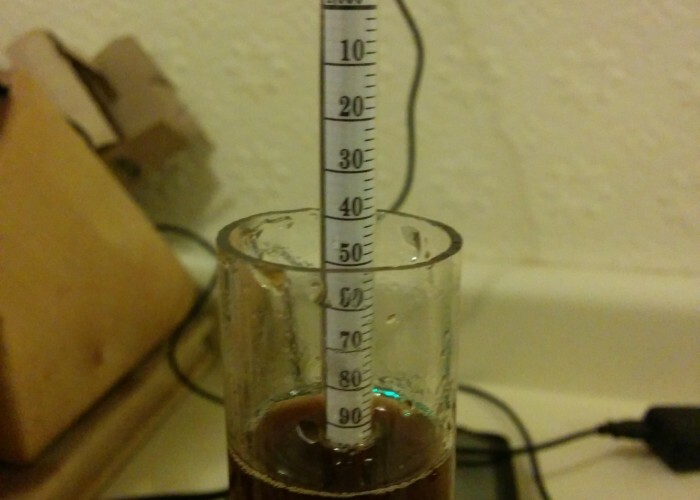 So if you are familiar with beer brewing, the first thing that you might notice is how high the initial temperature is. I attached the temperature sensor right after i pitched the yeast, which means the beer was at a temperature of ~77F at the time. Most ale yeasts prefer to be pitched into wort with a temperature in the high 60’s, so I was too hot by about 10 degrees F. I primarily blame this hot pitch on the fact that it was getting late, and I was too tired to sit around and wait for the wort to cool more, although I did not realize how hot the wort actually was. Of course, this also demonstrates one of the benefits of temperature logging. By keeping a detailed record of the temperature, I get an additional and more immediate form of feedback on my brewing methods. Another interesting aspect about the chart is the temperature fluctuations. It has only been a couple of days, so i don’t have a lot of data yet, but it looks like the temperature is fluctuating by about 5 degrees F due to the space conditioning in the apartment. 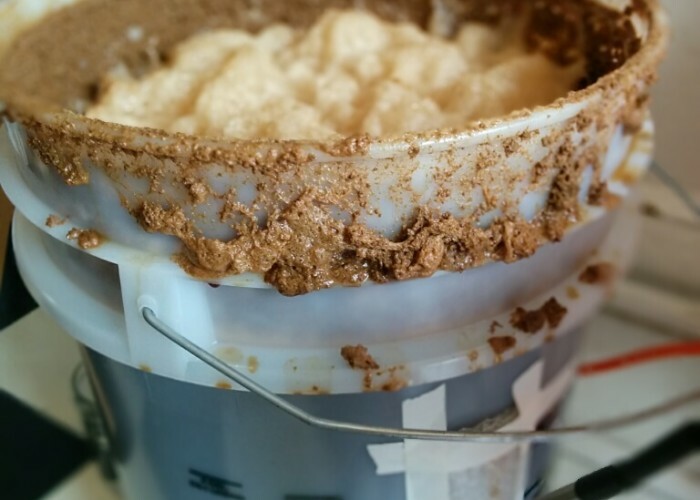 Because this is only a one-gallon batch, the beer is probably more susceptible to ambient temperature changes than the typical 5 gallon batch. 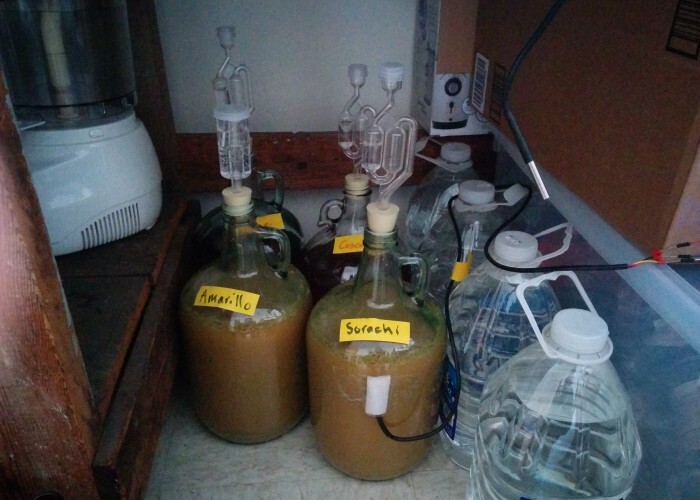 It will be interesting to see how a 5 gallon fermentation responds, and it could mean that I need to put more effort into controlling the environment for the one gallon batches to prevent any ill affects from temperature fluctuations (according to the literature, beer prefers fairly stable temperatures). Weighing out the grains. 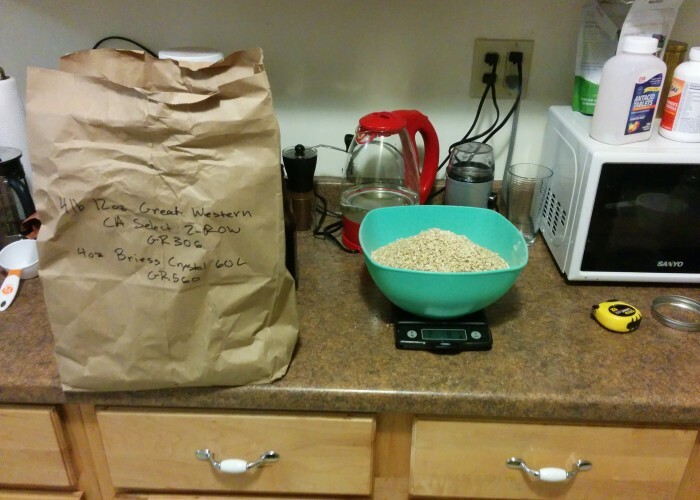 I got ~5 lbs of grain for two one-gallon batches. I split the grain in half, and used the same yeast, but used a different variety of hops in each batch. For the first batch, I used 1 oz of Cascade, and for the 2nd 1 oz of Simcoe. This is during the boil. 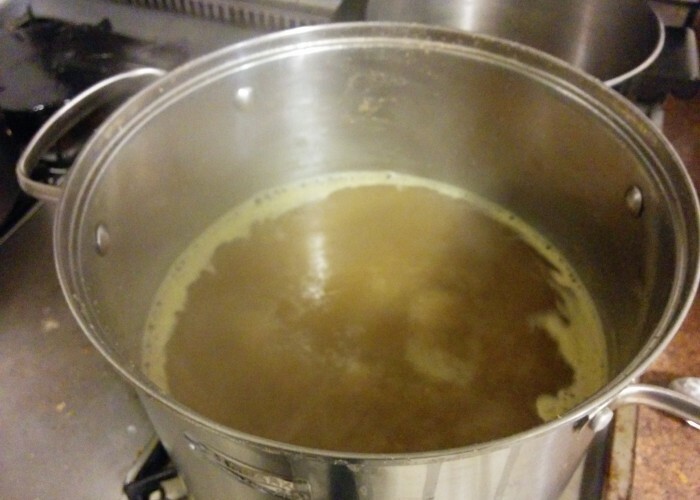 For each beer, I added 1/5 of the hops at the 60, 45, 30, 15, and 0 minute mark of the boil. This is the first batch of beer, a lot of trub at the bottom. I should probably start filtering that out a bit more. 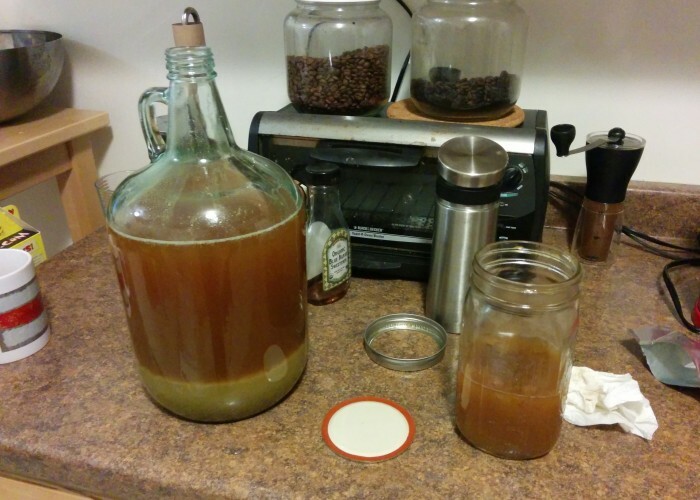 The small jar contains a yeast starter that I made. 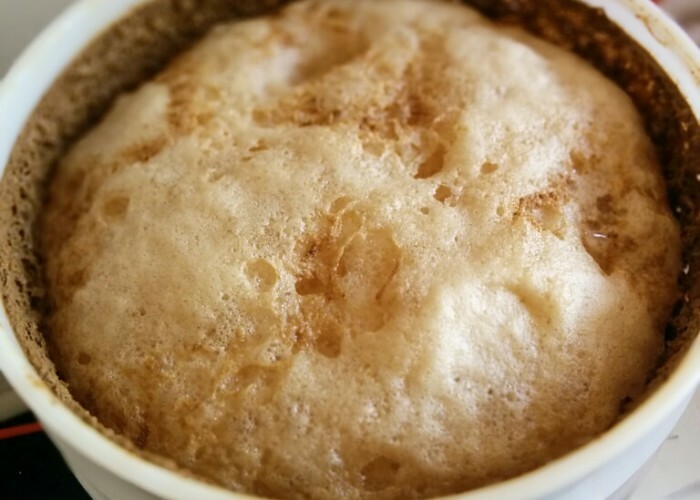 I washed some yeast from a previous batch of beer, but didn't end up with a lot of yeast from it. So I made an emergency starter early in the day using brown sugar dissolved in water and some raisin (apparently raisins have a lot of nutrients that yeast like). Seems to have worked out alright. 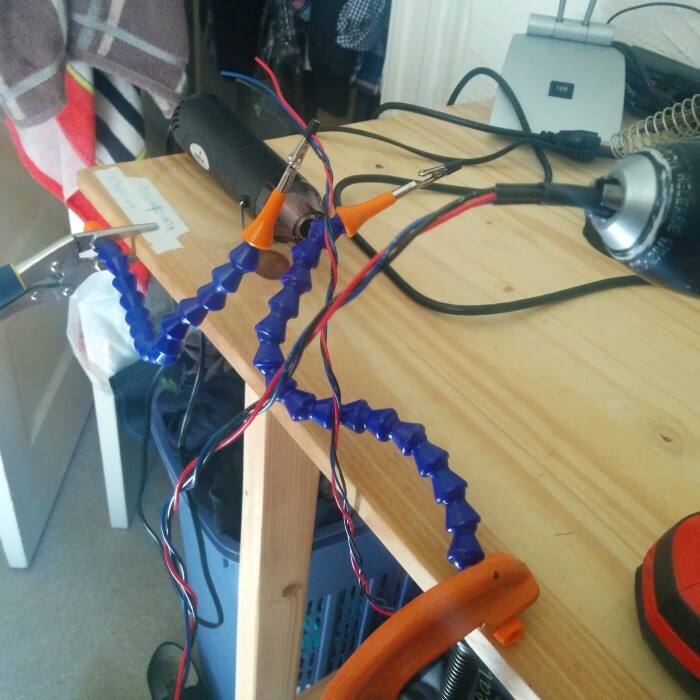 I used a small piece of packing foam to try and insulate the temperature sensor from the ambient conditions. Here is the final setup. 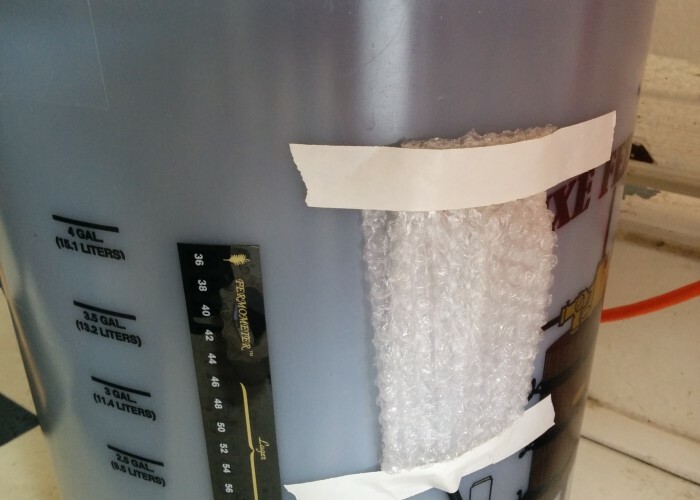 The sensor is taped to the glass carboy, with the piece of foam on the outside. The Arduino and RasPi are in the foreground. One final curiosity that I came across. I added a zoom in/out feature to the flot graphs, and when you zoom in on a small section of the plot, you can see some potential issues with the data. Hmm, this doesn’t look right? 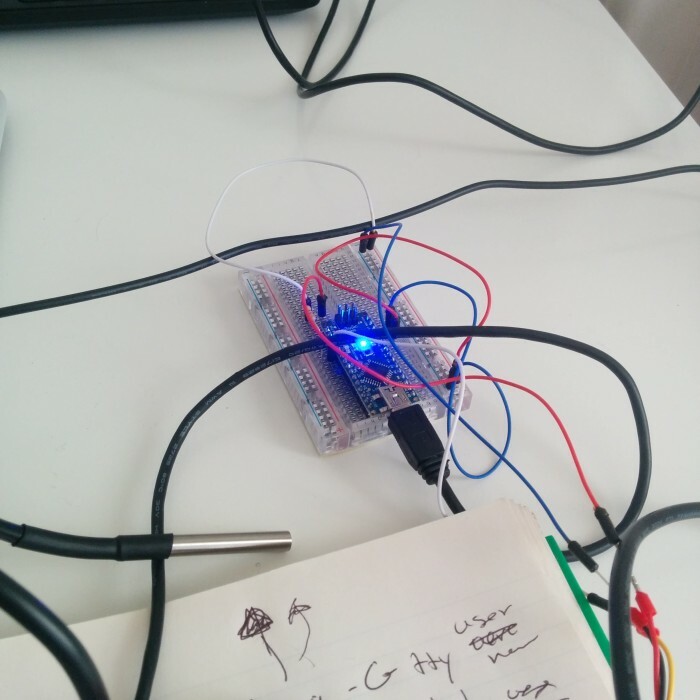 The Arduino sends a temperature reading to serial approximately once per second. 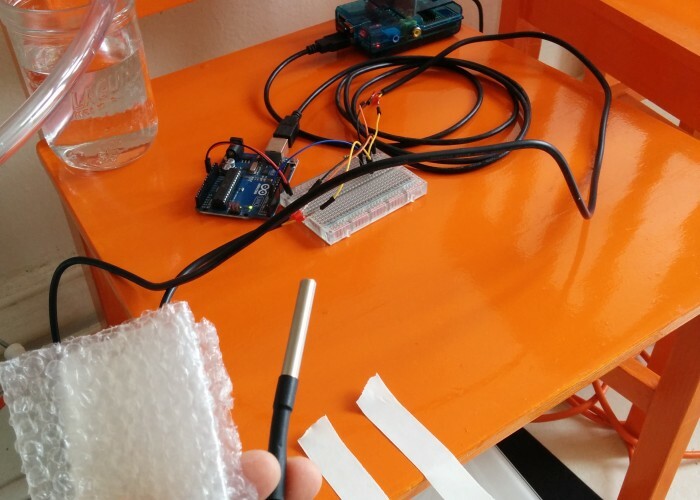 From there, the serial2socket.py takes the average of 60 consecutive temperature readings and sends that average across the socket connection. 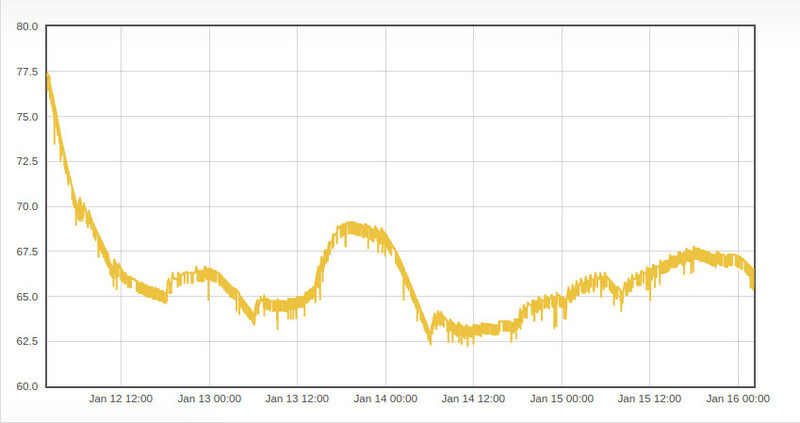 So my hunch is that the temperature sensor is returning some sort of bad signal or error code every now and then, and then that signal is getting averaged in with the good data. I will look into this further and report back on what I find. That’s all I have for now. I am going to start playing around with some of the flot graphs, and once the extra temperature sensors get here, I will start adding some more features to allow for better and more dynamic control over the system. Should be fun! 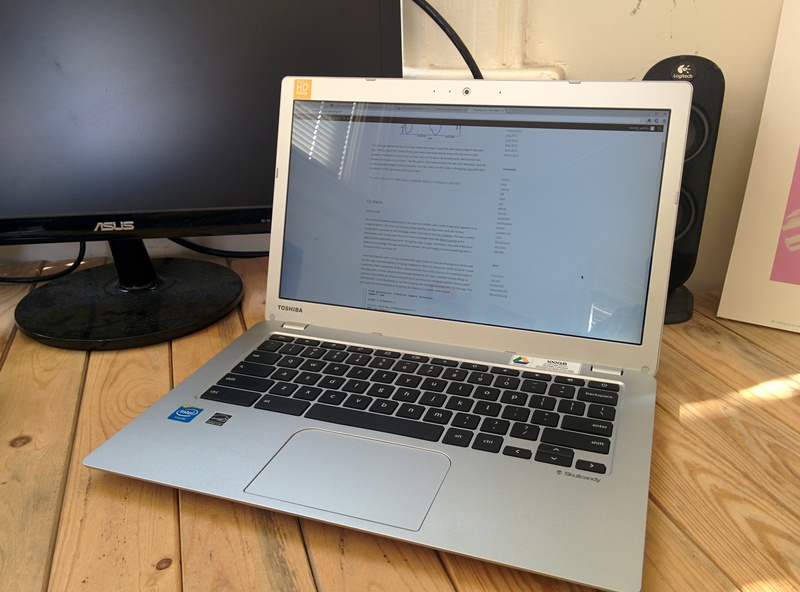 In a previous post, I discussed some of the issues I was having with running linux on a Chromebook (using crouton). The main issue was the small hard drive, 16 GB doesn’t give you a lot of room to work with. Accounting for the OS you are left with about 7 GB of usable disk space. For even light weight development, you will run out of space very quickly. Since I wrote that post I have had a few personal developments regarding the issue that I think are worth discussing. One of the main advantages of the Chromebook is the price. While Mac’s are great, laptops are inherently meant to be a portable device, and are therefore subject to high levels of risk for both damage and theft. At a cost of ~$250, I could go through 4 Chromebooks before reaching the cost of the lowest priced Mac Book Air. And as luck would have it, I ended up destroying (sort of) my Chromebook. 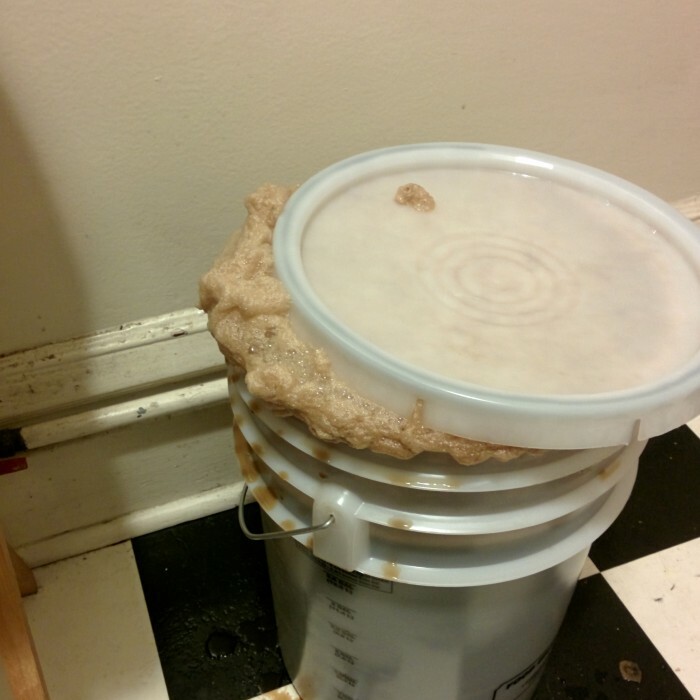 While brewing beer with some friends, a pint was knocked over and spilled all over the keyboard. Surprisingly, after drying the laptop out, it appeared to be alright, minus a few sticky keys and some weird behaviors from the track-pad. But about a week later, I spilled a cup of coffee on the thing (maybe it was sign?) and although the keyboard worked initially, it completely crapped out a few weeks later. How not too brew beer! I highly recommend keeping laptops in a safer location. The Chromebook still worked with a usb keyboard and mouse, but considering I move around a lot and like to work from coffee shops and libraries, it had lost a lot of it’s usefulness. A replacement keyboard would be around $50. While that isn’t too bad, there were no guarantees that that would fix the issue, and considering I would be doing the repair myself, I figured it would be best to move on. After all, one of the main reasons for using a Chromebook was their relative expendability. There were a handful of new Chromebooks being released so I decided to ‘upgrade’. 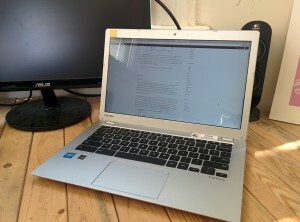 After some research, I chose to go with the Toshiba Chromebook 2 4GB model. The main reasons I went with the Toshiba were the 1080p screen, slightly larger size (13-inch), and the availability of the 4 GB model (a 2GB model is also available). The higher resolution and larger screen were a very nice upgrade, my Samsung’s 11-inch screen felt very cramped in comparison. I sprung for the extra RAM because the ChomeOS tends to resort to swap memory fairly often, and that slows things down. The Toshiba still only comes with 16GB of hard disk space, so I also sprung for a 64GB SD card. Including taxes, the laptop and card came in a little under $400. This puts it a little outside of the ‘expendable’ range, I felt that it was worth it. My initial impressions were very positive. The 1080p screen is gorgeous. The 13-inch size was just right, still small enough to comfortable fit in my backpack, but big enough to have a terminal and editor open side-by-side. In order to get around the issues of disk space, I choose to follow the instructions on this blog in order to get a crouton Linux environment running smoothly off of the 64GB SD card. And now that I had 64GB’s to work with I went ahead and did a big install, downloading all of the standard Ubuntu desktop applications and features. 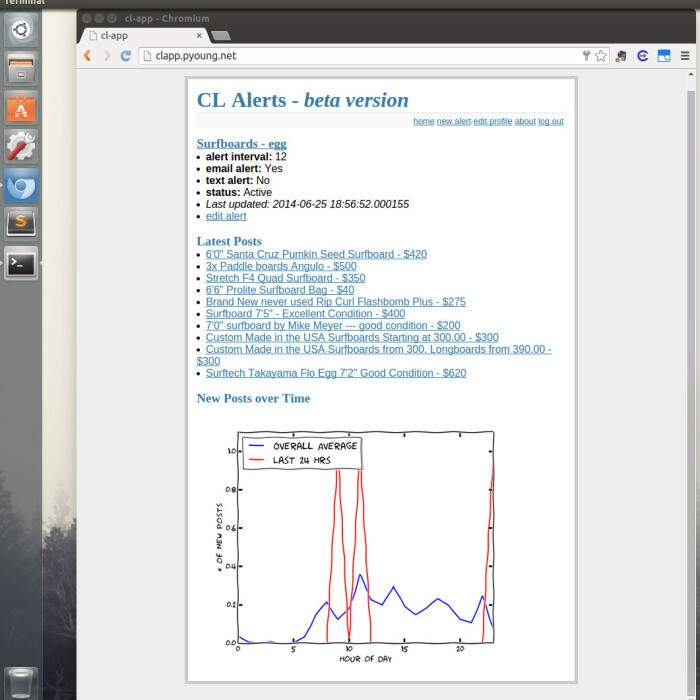 I even set up a second environment that I could use to experiment with the anaconda python distribution. I was pretty stoked. The Toshiba, look at that screen! But alas, the honeymoon didn’t last much longer than a few days. Turns out the current version of crouton doesn’t play well with externally mounted environments. When the laptop goes to sleep, the external media gets unmounted and returns in read-only mode. Essentially it freezes the session and requires a reboot. All things considered, it’s not a huge deal, you just have to remember to shutdown your Linux session before closing the laptop. But it is annoying, especially considering the boot time is pretty long due to the fact that it is reading system files off of the SD card. One thing I might try, is keeping the chroot on the internal SSD and symlinking the user and application folders to the SD card. Not sure if this would work, but something to consider. Alternatively, I could do a bare bones command line install on the SSD and use that when I need quick access, and save the full Ubuntu desktop environments for when I am putting in some solid hours. Fortunately I now have two Chromebooks, so I can test it out on the old one first! Anyways, overall, I am still pretty happy with the Chromebook. It’s light, has super long battery life (I only bring my charger if I am going to be gone for more than a day, pretty awesome! 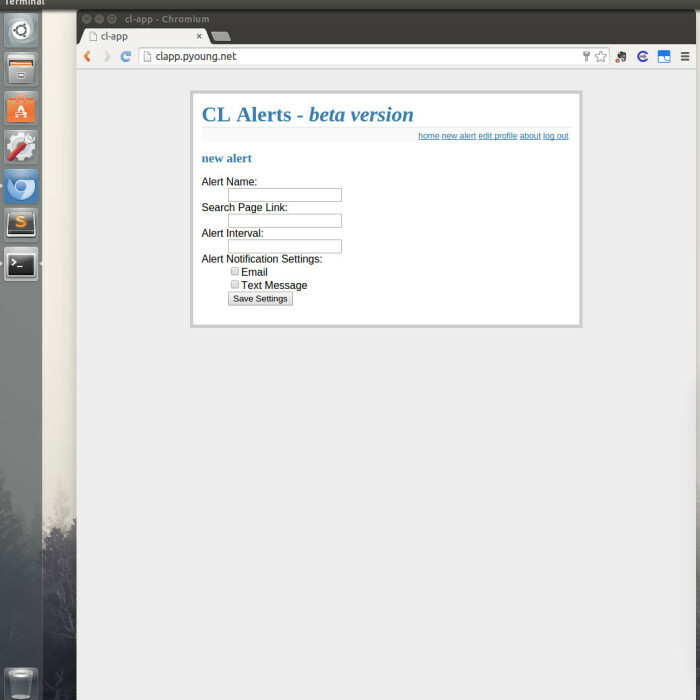 ), and most importantly, it runs Linux! As a word of advice, if you are looking at Chromebooks for the purpose of running a Linux distro, I would consider looking into a model with a 32GB SSD. With a 32GB, you could easily fit a large Ubuntu chroot on the SSD, and use a SD for external storage. If I find a good workaround for the sleep/unmount issue, I’ll be sure to post it here. I am in no way endorsing excessive levels of consumption. As stewards of our planet and our environment, I think it is important that we consider the implications of our consumption and our waste. My previous experiences with Mac’s have lead me to believe that despite their seemingly better build quality, the machines don’t have that much better longevity. The fact is, most of the internals for the electronics we buy are manufactured and supplied by many of the same companies, and the only real differentiation is premium materials/features and branding. And you will be happy to know that the Samsung Chromebook is still in service. 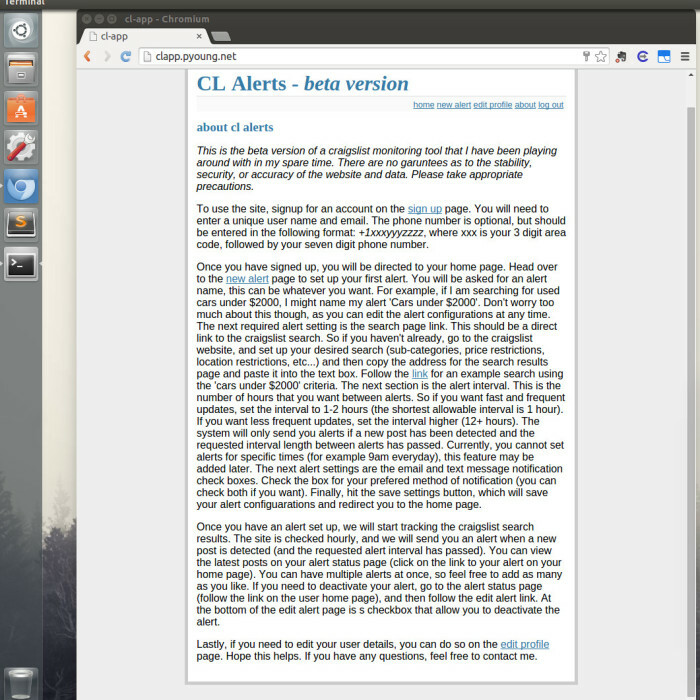 I have it set up as a desktop, and am playing around with some more experimental linux distros on it. At some point down the road, it would be fun to attempt to repair/replace the keyboard, once I get some other projects off my plate perhaps. 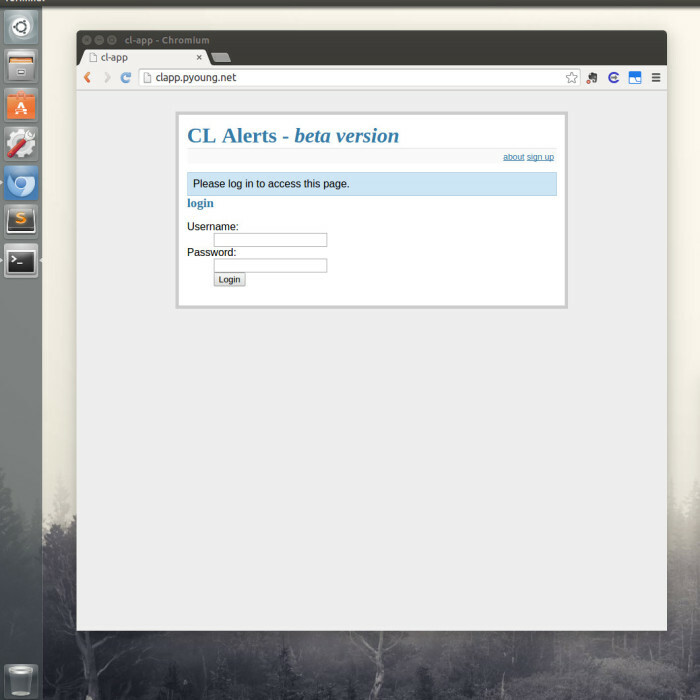 This entry was posted in beer, chromebook, couton, linux, thin client on January 9, 2015 by admin. This entry was posted in random on December 29, 2014 by admin.